Former prime minister Atal Bihari Vajpayee lost his breath at the age of 93 in AIIMS . He admitted in AIIMS on june 11 with kidney issue and complaints of lower respiratory track infection . He will always be cherished for his great contribution to indian politics. Here are some facts which are relativly unknown to people throughout his life. 1. 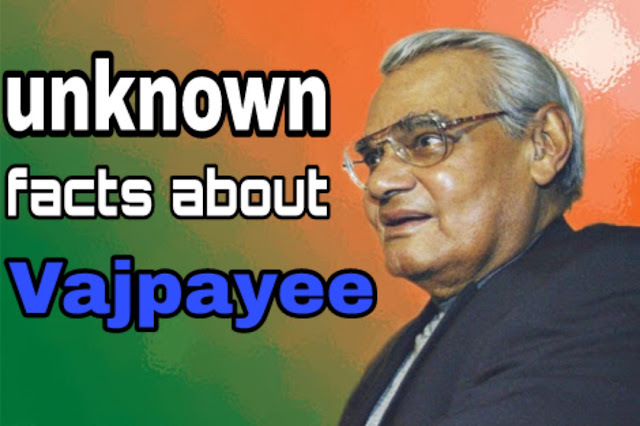 Atal Ji was born on 25 December 1924 (Christmas day). Mahamana Madan Mohan Malviya and Nawaz Sharif’s birthday is also on 25 December. 3. Atal ji was a brahmin by birth but loved non veg cuisune very much. His favorite food was Prawn. 4. Vajpayee was fluent in marathi as well. 5. Atal bihari vajpayee and his elder brother perticipated in the Quite India Movement and were inprisoned for a period of 23 days. 6. His father was his classmate . He and his father went to the same law collage ( DAV college in kanpur ) together for their law studies and shared the same room in the hostel. 7. He never married but has an adopted daughter. 8. When he was delivered his maiden speech in indian perliament , Jawaharlala nehru predicted that someday he would become the prime minister of india. 9.He is the only parliamentarian to win from 6 Lok Sabha constituencies from 4 states. Balrampur (UP), Lucknow (UP), New Delhi, Vidisha (MP), Gwalior (MP), Gandhi Nagar (Gujarat). 10. He remained an M. P. (Member of Parliament) for 47 years (11 times from Lok Sabha and 2 times from Rajya Sabha): One of the longest-serving parliamentarian. 12. Hestarted sarva shiksha abhiyan ,one of the largest education program to provide education to every child of india. 13. His birthday 25 december, was declared by 'Good Governance Day' as recognition his service to the nation.